This MRM library includes two methods: one for phospholipid classification by comprehensive analysis of the main phospholipids in biological samples, and one for fatty acid composition determination created using analytical results obtained with the classification method. The library targets phospholipids containing C14 to C22 fatty acids, and includes MRM transitions for up to 867 components. This library enables performing phospholipid profiling by conducting an initial analysis with a phospholipid classification method. This is followed by creating a method for fatty acid composition determination based on the phospholipid peak detected in the first analysis, and subsequently using this method to perform a second analysis to determine fatty acid composition. The phospholipids registered in the MRM library have fatty acid compositions with the carbon number and double bond combinations shown in the table below. The phospholipid targets of the library are phosphatidylcholines (PC) with a lyso-group, phosphatidylethanolamines (PE), phosphatidylglycerol (PG), phosphatidylinositol (PI), phosphatidylserines (PS), and sphingomyelins (SM). Focusing on the characteristic phospholipid head group, the library includes a method for phospholipid classification and a method for fatty acid composition determination (for fatty acid compositions of the given combinations) that make use of these MRM transitions. 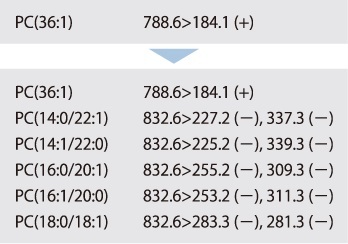 The figure below shows each MRM transition required to identify PC (18:1/16:0). 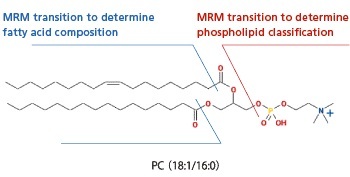 The phospholipid can be inferred by combining the analytical results obtained from these MRM transitions. The phospholipid classification method is capable of comprehensive analysis of the main phospholipids in biological samples. It determines the phospholipid class based on the main characteristic head groups of phospholipids. Its analysis targets are phospholipids that include C14 to C22 fatty acids. 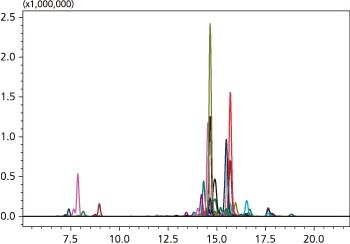 The phospholipid peak detected by the phospholipid classification method is identified. The structural information on the detected phospholipid at this point is the phospholipid class (PC, PE, PG, PI, PS, SM), and the total carbon number and number of double bonds in its constituent fatty acids. In the next step, the fatty acid composition determination method is created. 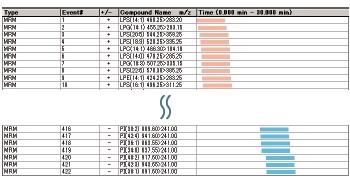 Software allows a fatty acid composition determination method to be edited from 867 MRM transitions for the phospholipid peak detected during first analysis. Edited in MRM Event-Link Editor, the fatty acid composition determination method is used to perform a second analysis on the same sample. 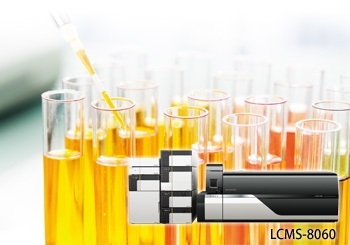 Phospholipid profiling can be performed based on the results of the first and second analysis. Based on the analysis results, it was determined that the sample contains PC (16:0/20:1) and PC (18:0/18:1), as shown in the figures below. his page may contain references to products that are not available in your country.